You don't get comedies like this any more blah blah blah. You do though you, well not just like it, but there are plenty of sitcoms that are as good it's just that we don't have only four channels any longer. It's harder for one program to get as popular as this did because of that. The sitcom is an interesting medium and it certainly threw up as lot of suggestions today. Some old, some new. But one stuck out for me more than any other. And I wasn't in any position to have seen the first series when it first aired as I was two in 1975. I do, however, remember my parents talking about it in revered terms and the excitement of the second series which aired in 1979. 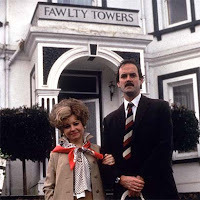 Fawlty Towers is a classic farcical British comedy set in a Torquay hotel run by Basil and Sybil Fawlty. Basil (John Cleese) is desperate for the hotel to attract a higher class of customer and is increasingly infuriated by his staff and their ability to screw things up for him. The man has a temper and is able to be rude to guests whilst appearing to be polite. Sybil (Prunella Scales) is the only character who can keep him under any form of control, most of his wrath being focused on Manuel (Andrew Sachs) the Spanish waiter. Connie Booth, Cleese's then wife, plays the maid Polly, who is the one character we, as viewers, can relate to. She knows that Basil is bonkers but tries her best to help him. The trouble is things always go wrong. Cleese wrote the sitcom with Booth and it's the genius of the farce that brings the show completely to life. The comedy revolves around Basil and his constant failures to get anything right. It's a brilliantly realised character and Cleese is the reason for that, although arguably it's one of the most perfect sitcom casts ever, Basil, though mad as a badger, somehow feels real. Two images stick in my mind more than any other. One is Basil 'thrashing' his car with a branch after it breaks down and the other is of him goose-stepping around the hotel dining room, in front of his much anticipated German guests, in order to cheer one of them up. After he'd already upset them by constantly mentioning the War. Despite making it clear to everyone else that mentioning the War was not the done thing. But then he was suffering from concussion after getting hit by Manuel's frying pan during a fire drill.... You see, crazy. But brilliant. Has it stood the time test. Yes, although of course it looks dated, but the comedy stands up. It's hard I think for anyone to go back to any comedy time and time again and continue to laugh. You know the beats of it, where the gags are and what's coming next. (Are you listening E4.) But I guarantee anyone coming to it fresh would find most, if not all twelve episodes, funny. It's still revered and still looked at as a benchmark. Every so often a sitcom comes around that people latch onto and Fawlty Towers did that in the same way that The Office and Black Adder did in later years. It's an icon because it's funny in a classically British way. Twelve episodes of pitch perfect British comedy at its absolute best. Dig out an episode. 'Next contestant Mrs Sybil Fawlty from Torquay. Specialist subject - the bleedin' obvious.' - Basil Fawlty. Tonight's post is dedicated to Tobs and @TraceySpacey.